One of the most profound episodes affecting Church history involved Emperor Constantine and his decrees against God’s laws. Yet the Church of God held fast. Jesus Christ warned His followers, “Do not think that I came to bring peace on earth. I did not come to bring peace but a sword” (Matthew 10:34). His words have proven true throughout the centuries, and especially during the fourth century in the Roman Empire. Another article on Church history discusses the loyalty of Polycarp and Polycrates in their defense of the New Testament Passover being kept on the 14th day of the first month of the Hebrew calendar. But persecutions continued against the Church. This article focuses on the decrees Constantine made regarding his interpretation of religious doctrine and the aftermath of his pronouncements. In the years prior to Constantine, a number of Roman emperors had persecuted the Church Jesus established. One such campaign was sanctioned by Emperor Trajan after he received a letter from Pliny (A.D. 111-113). Pliny was a young lawyer and governor over the territory of Bithynia and Pontus, along the southern edge of the Black Sea where some in the Church had originally settled (1 Peter 1:1-2). So, in the early part of the second century, we see persecution directed toward the Christians in the area of Asia Minor. This persecution continued, but the Church of God remained firm and loyal. So, there still existed faithful men despite the terrible persecution that ensued. It is also interesting to note that one of those trained at the court of Diocletian, who was also present in Nicomedia during the persecution in A.D. 303, was Constantine. He eventually became a great general and, after many victories on the battlefield, was hailed by his troops as the next Augustus and later became emperor. In A.D. 312 Constantine invaded Italy to oust Emperor Maxentius, who had up to four times as many troops. Constantine claimed to have had a vision on the way to Rome, during the night before battle. In this dream he supposedly saw the Chi-Rho symbol, the first two letters of the Greek word for Christ, which some believed was a symbol of Christ, shining above the sun. Seeing this as a divine sign, it is said that Constantine had his soldiers paint the symbol on their shields. Following this, Constantine went on to defeat the numerically stronger army of Maxentius at the Battle of the Milvian Bridge. 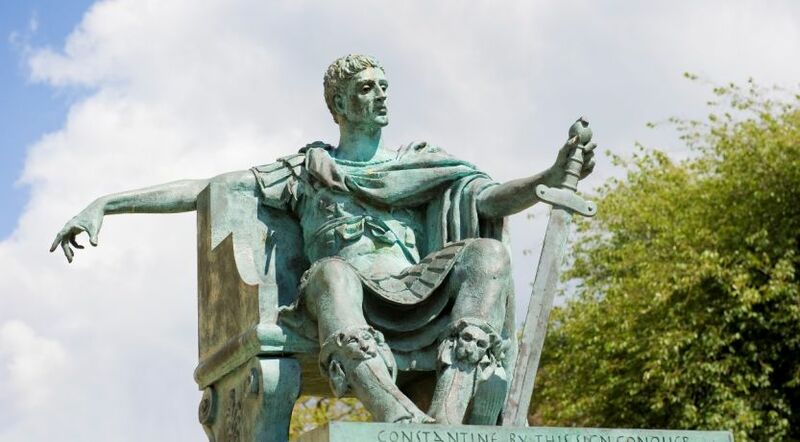 Religiously, Constantine was still a pagan who worshipped the gods of Rome, including the sun god. It wasn’t until much later, just before his death, that he supposedly converted to Christianity. Religiously, Constantine was still a pagan who worshipped the gods of Rome, including the sun god. It wasn’t until much later, just before his death, that he supposedly converted to Christianity—a Christianity he had helped shape that was quite different from the Christianity of the early New Testament Church. In one of his first major decisions as emperor, Constantine coissued the Edict of Milan in A.D. 313. It basically ended any further persecutions of the Christians. Even though the edict gave Christianity legal status, Christianity did not become the official religion of the Roman Empire until Emperor Theodosius I in A.D. 380. In A.D. 314 Constantine summoned the bishops of the western provinces to Arelate (Arles) after a schism had split the Catholic Church in Africa. In his readiness to resolve this matter through peaceful debate, he also revealed a desire to insert himself into religious issues concerning doctrine. One of the most famous gatherings over which Constantine presided was the Council of Nicaea in A.D. 325. Over 300 bishops of the Roman church convened to discuss a number of theological questions. One of the decisions reached was that Easter should be observed instead of the Passover. So, here we see a complete reversal of a law of God (Leviticus 23:4-5; 1 Corinthians 11:23-25, 26, 27-28). One of God’s festivals was replaced by a pagan celebration. However, four years before the Council of Nicaea, an even more profound and long-lasting decision was implemented by Constantine. And it went directly to the core of God’s laws. This decision had far-reaching effects. Not only was God’s law rejected, but people began to celebrate a pagan day (in honor of the sun god) instead of the seventh-day Sabbath, which is the true Sabbath day upon which humanity was to worship and honor God (Deuteronomy 5:12-14, 15). Later, in A.D. 365, long after Constantine had died, an infamous declaration was made at the Council of Laodicea: “Christians must not judaize by resting on the Sabbath, but must work on that day, rather honouring the Lord’s Day; and, if they can, resting then as Christians. But if any shall be found to be judaizers, let them be anathema from Christ” (Council of Laodicea, 29th Canon). Then, later in the early 400s, Augustine, one of the Roman Church’s theologians, proclaimed, “The holy doctors of the church have decreed that all the glory of the Jewish Sabbath is transferred to it [Sunday]. Let us therefore keep the Lord’s Day as the ancients were commanded to do the Sabbath” (Robert Cox, Sabbath Laws and Sabbath Duties, 1853, p. 284). As a result of these man-made edicts, a large portion of the world has been following false decrees, but not all people changed their beliefs to worship on Sunday. As persecutions over the Sabbath intensified, members of the Church of God migrated to the west, and history reveals that the Church thrived in the Balkans and Eastern Europe. But that is another story for another article. Why Is Christianity Becoming Irrelevant? Was Christianity Designed to Evolve? Who Are You Calling “Father”? True Church: What Is Its Name? World Religions: Why Are There So Many? You Can Become a Saint! What Kind of Worship Does God Want?